This fabulous new book in the Trouble series by the wonderful Cate Whittle is fun, clever and witty – perfect for early independent readers starting to gain confidence with chapter books. Nina is the new kid at school. She is tidy and organised and smart and, well, she’s not at all like Georgia. When Georgia tells Nina about her dragon, Trouble, Nina rolls her eyes and says ‘hmnph’. Nina doesn’t believe in dragons. Nina doesn’t like to talk about anything that is not real. Despite the efforts of Georgia and all the other kids at school, Nina refuses to believe that dragons exist. When Trouble finds out Nina doesn’t believe in him he starts sulking. He won’t even eat his favourite potato chips and fizzy sarsaparilla drink. Then, something terrible happens – Trouble starts to fade away! What can Georgia do? She must come up with a plan to get Nina to believe in Trouble, but how will she get Nina to see him when he’s been banned from school? Will Nina believe before Trouble disappears? This fabulous little story is narrated by Georgia, interspersed with her hilarious commentary on everything happening around her. The rambling train of thought in young Georgia’s mind will certainly ring true for anyone who has lived with an imaginative six to eight year old! 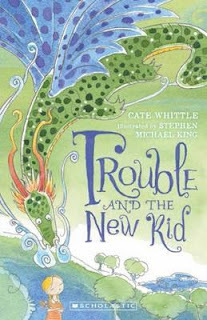 Stephen Michael King’s fantastic illustrations bring out the humour and imagination in the story and will help readers fall in love with the expressive Georgia and delightful Trouble. This is the third book in the Trouble series and is a funny and engaging read that lower primary kids will love.